Learn more about the Newburgh Conspiracy and the role George Washington played in saving the republic at its most vulnerable point. Was the young American nation at risk from a military coup in 1783? Watch as Dr. James Kirby Martin, a nationally recognized scholar of the Revolutionary War, discusses the conspiracy that threatened to destroy the nation before it began. Learn more about the military quarters near Newburgh, New York, the Continental Army's last winter encampment of the American Revolution. Read more about the mutiny that almost was, and one of its possible architects, in this piece from Mount Vernon's Digital Encyclopedia. Read a transcript of George Washington's March 15, 1783 address to his officers. Washington achieved one of his greatest triumphs with words, rather than bullets or bayonets, and ultimately turned the fate of history. 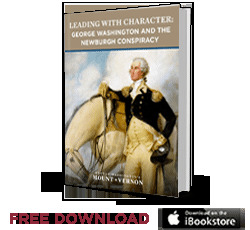 This case provides a conceptual understanding of character, and describes its role in exemplary leadership. See a 20th-century representation of George Washington celebrating peace with Great Britain in his Newburgh headquarters. Restlessness and inaction during the long peace process played a major role in the rise of the Newburgh conspiracy. At the close of the American Revolution, George Washington wrote a letter to the governors of the 13 states. Read the letter here, and learn more about Washington's hopes and vision for his new nation. Discover more information about Newburgh, New York and General Washington's travels in 1783. Its March, 15, 1783 and your officers, poorly paid and supported, are contemplating action against Congress. What will you do? Play the Newburgh Conspiracy scenario in Be Washington. Watch Mount Vernon's newest animated video presentation about George Washington and the forming of the U.S. Constitution.